By Linda Linonis | January 29, 2015 at 12:01a.m. 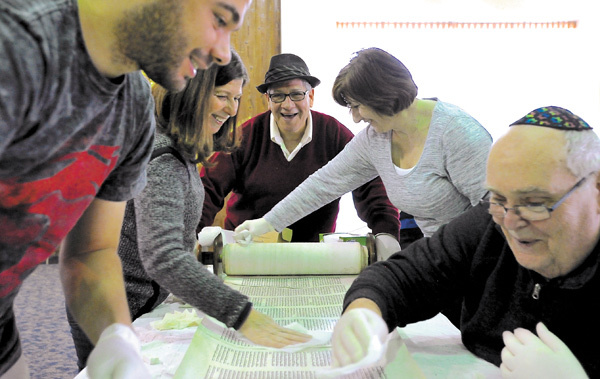 Neil Yutkin, at end of table, chairman of the ritual committee at Congregation Ohev Tzedek in Boardman, unrolls the Torah as volunteers begin wiping it down. From left are Josh Ford, Debbie Tosi, Linda Davis and Jim Smythe. Cleaning the Torahs is a special project at the synagogue. This Torah is about 125 years old. A special project at Congregation Ohev Tzedek is bringing participants “closer to God” while fulfilling a mitzvah, a good deed. Neil Yutkin, chairman of the ritual committee, said the scribe, Rabbi Menachem Bialo, evaluated the conditions of the Torahs at Ohev Tzedek. “He told us what needs to be done on each one,” Yutkin said about the cleaning effort. Over time, the Torahs have accumulated “schmutz,” the Yiddish term for dirt. The built-up grime must be removed before the scribe makes any other repairs and corrections. Members of the congregation volunteering for the cleanings are accomplishing multiple goals, Yutkin said. “This allows members to get closer than ever to the Torahs,” he said, noting the unique opportunity. At Ohev Tzedek, the Torah is generally read by the rabbi but any Jew may read from the Torah. With members taking on the cleaning task, they also are saving the temple money. Yutkin said the temple has eight Torahs and one Holocaust Torah. The Torah undergoing the cleaning is about 125 years old. Yutkin said that sacred scroll is one of the “youngest” Torahs at the synagogue. The Holocaust Torah is 300 years old. It is Scroll No. 58, one of 1,564 rescued Holocaust Torahs on permanent loan to the temple from the Memorial Scrolls Trust at Westminster Synagogue in London, England. The Torah is the five books of Moses, beginning with Genesis and ending with Deuteronomy. Torahs, written in Hebrew, are read from right to left. Yutkin said the Torah being cleaned is Sephardic. That term describes the region — Spain, Portugal, North Africa and the Middle East — where the scribe who copied the Torah is from. “Most likely it was an Israeli scribe who studied in one of those places,” Yutkin said. Rabbi Saul Oresky said the Torahs are handwritten and scribes copy from another Torah. The rabbi said there are four to five columns of text in each panel. “If a scribe makes a mistake while writing the name of God, he must start over on that panel,” he said. The cleaning is simple but takes time, Yutkin said. A polymer eraser is used to remove the dirt from the parchment, which was created from the hide of a kosher animal. “You go over it lightly, “ Yutkin said, adding the dirt is whisked away with a tissue. The Torah cleaning project began Sunday and will continue as volunteers are available to complete the task. Yutkin said the Torahs will be cleaned in order of how frequently they are used. Rabbi Oresky said three of the Torahs are most often used at the High Holidays; there are mistakes in the other Torahs, the result of human error. “Over the years, smudges build up,” the rabbi said. He continued that when the Torah is read, a pointer is used so that oil from one’s fingers won’t get on the parchment. But over time, dirt does accumulate. Rabbi Oresky said Torahs that are damaged to the point of no longer being “readable” are buried in a Jewish cemetery. March 6, 2015 12:05 a.m.